I coach people in all kinds of different situations – primarily business success, but sometimes career. I’ve noticed that several numbers keep cropping up over and over again, and I think I’ve figured out why. 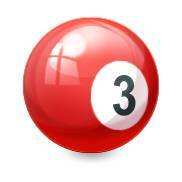 Three: I’ll ask a client to come up with three alternatives when stuck in an either/or situation. He’s thinking that he needs to either stay in his job (which he hates) or to leave (which is scary as hell). Or she’s stuck between giving priority to customers or to employees. Looking for a third alternative can really open up creativity. When you’re viewing a decision as black or white, finding (or inventing) splotches of color is a great way to see the much larger range of possibilities. Even if you go back to picking black or white, you’re now doing it having compared it with expanded thinking. Five: This is a great number to use when we want a bit more brainstorming going on, but you can still keep all the alternatives in your mind. Suppose that I’ve asked you to name five people in your life who really care about you. You start with your parents and spouse/partner, of course, but then you have to start thinking. Maybe you decide to include a good friend and another you haven’t seen for a few years. Now insight is starting to emerge! You might decide that it’s important to go back and re-connect – something that wasn’t even being considered when we started the conversation. But five is often achievable, because you can SURELY think of five people. It’s just a matter of figuring out how to think through the list. And because you can remember all five without writing anything down, you’re easily able to compare each against the other in your mind. If five feels too limited or trivial, I’ll sometimes increase this to seven. It’ll work the gears just a bit harder. Ten: Now we’ve stretched beyond what can be remembered, so it’s time to get out the pen and paper. But with ten things, it’s still usually within the realm of possibility. Suppose that I’ve asked you to keep track of the next ten people who walk into your shop. That might take an hour or a day, depending on what kind of business you have. When you’ve looked at ten, you start seeing patterns emerge, but you’re not necessarily freaked out by the amount of work it’s going to take. If it’s interesting, you may even decide to continue the task. Fifty: I don’t use large numbers like this often, because the sheer magnitude of the request can feel overwhelming. Even flipping a coin 50 times sounds like pointless drudgery unless there’s some decent payoff at the end. But for truly important work, it may be worth the investment. I recently talked to a person starting up a new business, and told her that she should strive to talk with 50 target customers before launching. I used this scary number because she’s in a space which is changing quickly and the parameters are quite fuzzy. I was convinced that she’s going to go through several important learning experiences over the course of the next few months, so she needs to keep the focus on listening to what people are saying. The power of one is to drive you to clarity and focus. We’re not saying that everything else is unimportant, just that there’s something which is at the top. Which applies extra energy to actually get it accomplished.